Because of its nearly three-hour running time, Heat, Michael Mann’s sort-of magnum opus, is often described as a “crime epic” or “crime saga,” which are funny things to call a movie that has the basic plot of a bare-bones 80-minute B-noir. In the Los Angeles of the mid-’90s Hollywood imagination (highway underpasses, modernist homes, and diners, including the screen-ubiquitous Johnnie’s Broiler), a detective from Robbery-Homicide Division tails a professional thief who specializes in high-stakes heists. They meet only twice, once in the middle and once at the very end, and even then, their faces are never visible in the same shot, as though each occupied his own discrete cinematic space. Mann’s underworld thrillers—Thief, Heat, Collateral, Miami Vice, Public Enemies, and the recent, unfairly maligned Blackhat—blend fantasies and realities of crime. His screenplays are notoriously wordy, but play as minimalist on screen, with paragraph blocks of novelistic detail used to inform single gestures. He collects psychologies and reams of off-beat technical information and transmutes them into archetypal stories. Heat, for example, is based on a real case worked in the ’60s by Chuck Adamson—the retired Chicago cop who first collaborated with the director as a consultant on Thief, and later co-created the seminal Crime Story, produced by Mann—involving a career thief, also named Neil McCauley. Though the time frame is compressed and the stakes are exaggerated, much of Heat lines up with real events, including the conversation at the restaurant between McCauley and Hanna, a stand-in for Adamson. One could go as far as to say that Mann—whose 12-hour-a-day work ethic has earned him a reputation for being difficult—obsessively depicts obsessive professionals. Elements of McCauley can be recognized in James Caan’s character in Thief, presumably suggested by Adamson, and before making Heat, Mann worked the plot out in a 1989 TV movie called L.A. Takedown, intended as a pilot for a new series. (Though interesting to Mann aficionados, it’s easily his weakest feature-length work; Mann’s directing style demands strong personalities and plenty of time, and L.A. Takedown had neither.) After Heat, he returned to the material he’d accumulated for the Hanna character to make Robbery Homicide Division, a short-lived TV series starring Tom Sizemore, who’d played one of the members of McCauley’s crew in Heat. And the Heat story isn’t alone in Mann’s filmography in this respect. Even the pulpy Blackhat has its roots in a real-life criminal (muscular, Nordic-looking bank hacker Stephen Watt, another of Mann’s consultants), and seems to have had a long development; many of its plot points first popped up in, of all things, a Mercedes-Benz commercial Mann directed in 2002. Many of Mann’s films exist in multiple cuts. He is, in other words, a tinkerer and re-packager—and also a sculptor, because the same tendency to shape and fiddle that leads him to rework story ideas and characterizations over and over produces figures and images of serious potency, often framed against blank canvases of city, sea, or sky. His terse dialogue has a similar crafted quality, though perhaps it’s easier for writers than regular viewers to appreciate the work that goes into a construction like “I’m alone; I am not lonely.” Mann, often discussed in terms of visual style and theme, is under-appreciated as a dialogue stylist. 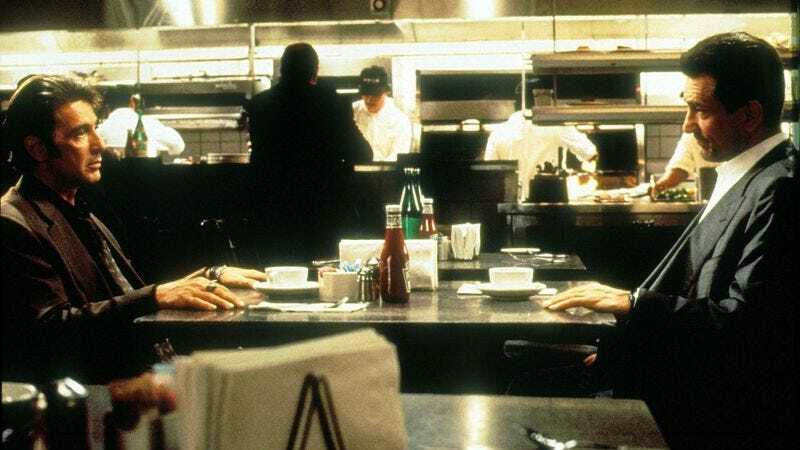 “Neil’s voice is street, but his language is precise like an engineer’s” is how he introduces McCauley on the first page of Heat’s screenplay, and that almost describes the writer-director’s best dialogue: direct, carefully worded, lacking ornamentation, with lots of “I”s and “you”s. Contractions (or lack thereof) control rhythm, inform performance, and create meaning. The McCauley-Hanna conversation in the restaurant—set at an airport food stand in the script, foreshadowing their final meeting—is a marvel of carefully fitted parts. So is the rest of the movie. Maybe that’s why, in the two decades since its release, Heat—a film that was very well received, critically and commercially—has only grown in stature, and come to be regarded as a modern classic and a point of reference for genre filmmaking. Newness depreciates in value over time, but craft and expression remain. Most of Mann’s movies—quite a few of them flops—have become more highly regarded over time. Interestingly, the “newness” angle is almost exclusively related to plot; Mann’s movies—which would grow more and more abstract beginning with his next feature, 1999’s The Insider—have never really resembled anyone else’s work. His serial-killer movie Manhunter, now considered a classic of the genre, was dismissed by quite a few critics in its time for being vapidly stylish. Mann’s perennial problem, it seems, is that his plots are too old and that his movies look too new. Heat’s visual values—abstracted cityscapes, underlit interiors, a palette of cool tones—aren’t all that different from those of Thief or Manhunter, but, by 1995, they’d come to seem classical. (Let’s call this phenomenon “aesthetic creep.”) And once you get past the perceived lack of narrative freshness, what you find are a masterful sense of proportion, several staggeringly tense set-pieces, the last truly great lead performance of De Niro’s career, and the clearest possible expression of a familiar theme, which reaches its peak in the final shot, with two men posed as purposefully as figures in a Renaissance painting, while airport runway lights converge behind them into a vanishing point and Moby’s “God Moving Over The Face Of The Waters” rises on the soundtrack. The composition is at once immediately legible, somewhat enigmatic, and moving. One of Heat’s more classical qualities, at least as far as narrative is concerned, is that it treats its ending as a destination—where it’s going to take its audience, rather than where it’s going to leave them. In other words, Heat is the movement toward this final image, a stylized figuration of two loners separated by law, but united by mutual professionalism and isolation. It expresses nothing that the movie hasn’t already, nothing that isn’t long codified into the opposite-sides-of-the-law genre, but it expresses it with a purity that comes through even more clearly because of the 170 or so minutes that precede it, with all of those carefully managed supporting characters and interlocked conversations. It’s been done before and since, but never better.